An Eastern European sensibility and industrial undertones endure in the borough’s northernmost pocket. 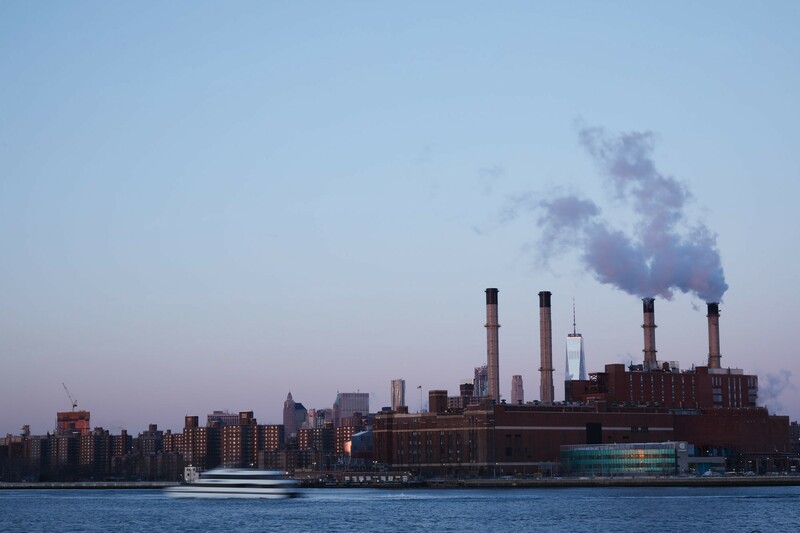 The East River ferry transports Greenpointers from factory-dotted shores to the skyscrapers of midtown Manhattan. On a map, the outline of Brooklyn takes the rough shape of a human heart. At the top — its aorta — is Greenpoint. It’s the buzzing and boisterous interface between Queens and Kings County, a neighborhood that sends many of its residents to Manhattan during the day, and then accepts them back when the working day’s done. The entirety of Greenpoint occupies fewer than three square miles, but it feels bigger. Especially on Monday morning, as the sun breaks over the Polish delis and bakeries, the sleepy bars, and wood-frame houses. As daylight moves west along Greenpoint Avenue, the neighborhood’s main east-west artery, it passes hip cafés and utilitarian bodegas before crossing the lawn at waterfront Transmitter Park and splashing into the East River. 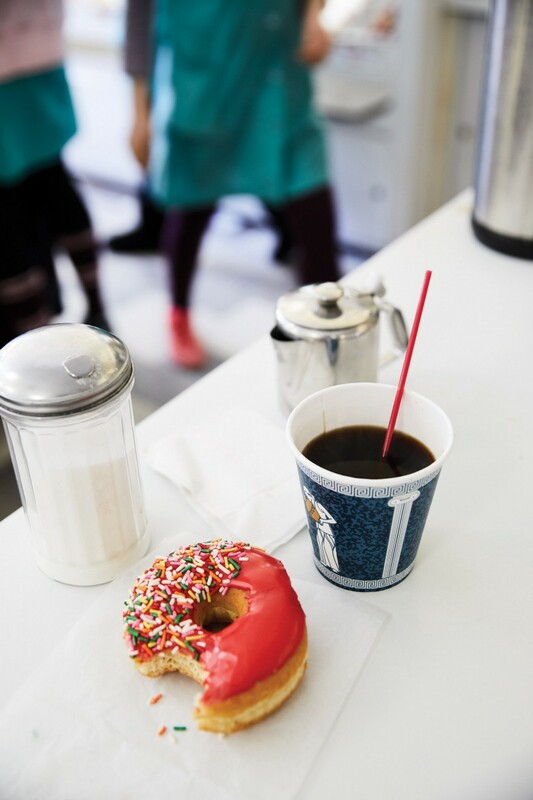 Left: From 4:30 am, Peter Pan Donut & Pastry Shop serves up crullers and coffee at this counter-only classic. 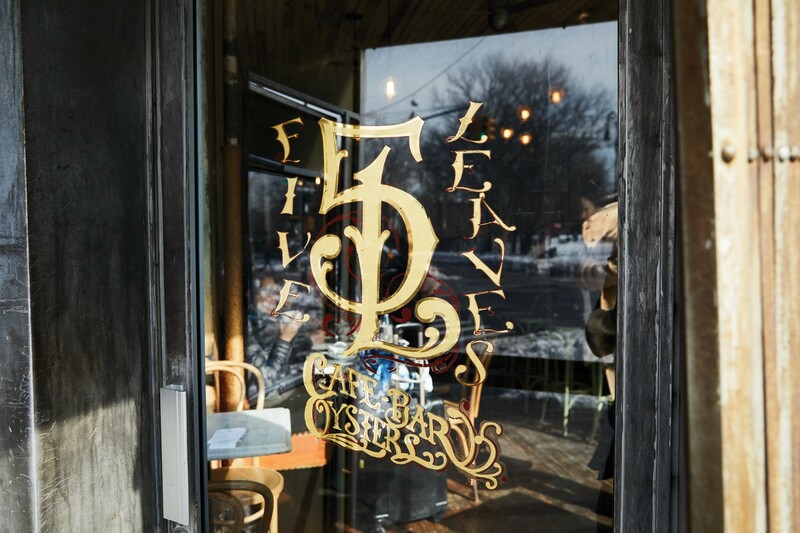 Right: Beloved for its ricotta pancakes and sidewalk seating, nautical-themed Five Leaves first put the ‘hood on the map in 2008. In recent years, Greenpoint has earned a reputation as a hub for young professional transplants. The HBO show Girls was set here, and the crowdfunding site Kickstarter moved into the landmarked Eberhard Faber Pencil factory on Kent Street. More recently, A/D/O, a co-working space for designers and artisans, is breathing new life into Greenpoint’s manufacturing legacy from its 26,000-square-foot warehouse space on a sleepy stretch of Norman Avenue. The change is welcome, but it exists alongside a strong cultural force, one built over time by immigrants from Eastern Europe, mostly Poland, who began arriving at the end of the 19th century. The area’s first Polish church, St. Stanislaus Kostka, was erected in 1896, anchoring a neighborhood that is today still referred to as “Little Poland.” The church stands on Humboldt Street — two neo-Gothic spires that tower over the apartment buildings around it. House-cured bacon and smoked kielbasa hang in Nassau Meat Market’s time-tested storefront. 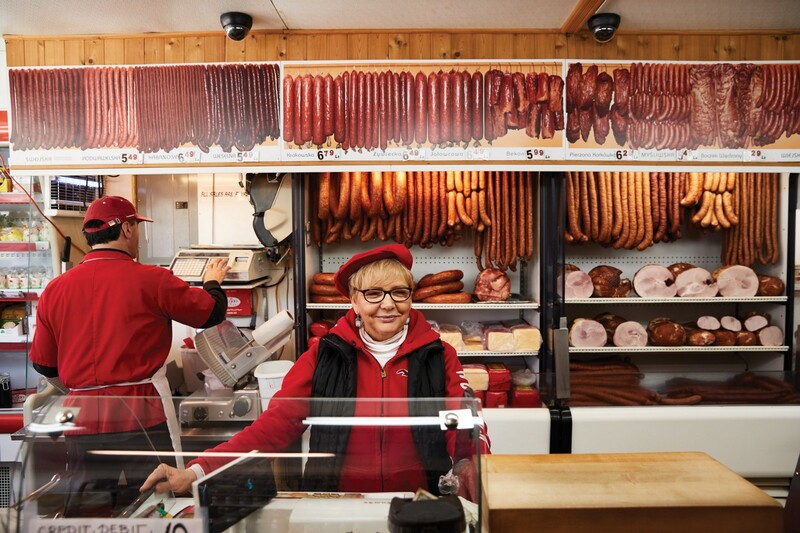 Greenpoint’s meatmarkets still hang kielbasa from the ceiling and serve sauerkraut from deep ladles; restaurants like Karczma, Christina’s, and Krolewskie Jadlo continue to populate their menus with decidedly Eastern European fare like pierogies and stuffed cabbage. As the two-lane streets warm with early morning sunlight, cyclists on fixed-gear bikes stream north and south, heading for bridges that will take them from this quaint village into “The City.” Other commuters grab pour-over and single-origin coffees from newcomers Five Leaves and Sauvage before jumping on the G train, the neighborhood’s only subway line. Nearly 200 years ago, shipbuilders and farmers made their simple homes here, mostly from wood; many of them still exist on residential blocks like Milton, Java, and Kent. The builders’ industrious tenor thrives in places like Greenpoint Beer & Ale Co., where brewers begin canning beer shortly after arriving at 6 am. You see it in the Polish cashiers showing up for work at Peter Pan Donut & Pastry Shop even earlier. The bakers are there by 2 am, dropping dough into the fryer and working off a recipe that hasn’t changed in more than 60 years. 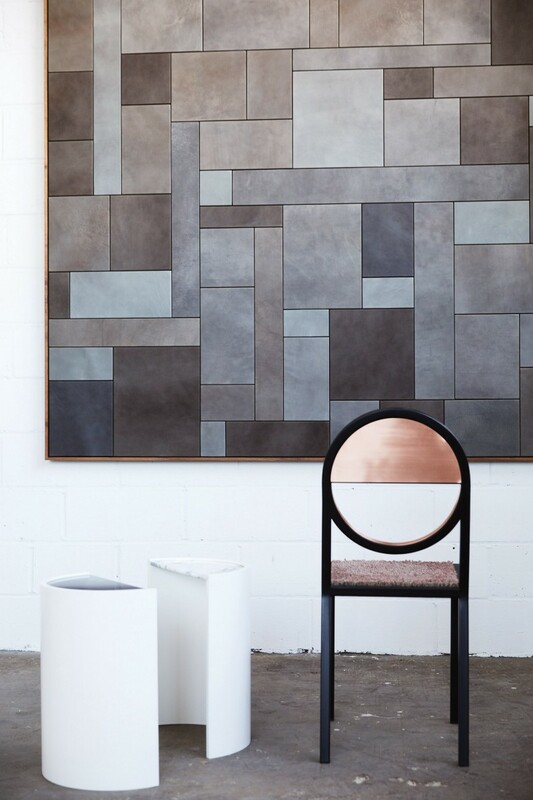 Left: Bower manufactures its modern furniture out of a jute mill dating from 1868. Right: A/D/O has turned a Greenpoint warehouse into a café, communal workspace, and fabrication lab for the area’s designers and artisans. Across the street is Polka Dot Café, a restaurant that represents the merger of Greenpoint’s old and new. The place used to be the Polski Meat Market until a rebranding effort gave it a new façade, complete with a walk-up coffee window and playful hand-painted lettering above the door. But despite its Instagrammable signage, the shop’s deli counter holds a bounty of traditional Polish standbys: pork shanks, cured meats, and beetroot borscht made thick with beans and potatoes. The kitchen staff lifts Polka Dot’s garage-door style gate just before the doors officially open at 7 am. Locals coming in for breakfast order coffee from the Brooklyn Roasting Company along with potato or zucchini pancakes. If they have the appetite for it, they might get them stuff ed with beef goulash. A gray-haired man wearing house slippers orders in rapid-fire Polish, and the cashier, Magda Mierzwa, 24, chats him up before he shuffles toward his table with the help of a cane. Mierzwa was born in Poland, and moved to New York with her family when she was 7. Her co-worker, Sara Puk, 18, is second generation. “Born and raised in Greenpoint,” she says proudly, before taking a customer’s order in Polish. Slippers-guy finishes eating and then goes outside to sit on the bench in front of the restaurant. The morning rush ebbs, and then it’s lunchtime. By dinner, the commuters are returning from Manhattan. The pulse of the neighborhood thumps along in its steady rhythm, preparing Greenpoint for the future, while protecting the heritage that roots it in the past. Loren Cronk cuts raw denim with long steel scissors, sewing and riveting jeans that nod to the sturdy workwear of Greenpoint’s past. The garage founded by the infamous stuntman and motorcycle builder still turns out colorful, chopper-style bikes. The shop’s offerings are simple but elegant — mugs, bowls, planters — intentionally imperfect and splashed with colors. Sleek housewares, furniture, and lighting fixtures emerge from this firm’s studio within the Greenpoint Manufacturing & Design Center.